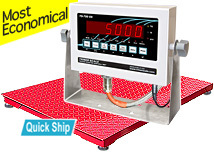 Our rectangular floor scale packages are designed for easy setup and high accuracy. With our outdoor rated, factory calibrated industrial floor scales, your business can weigh drums, pallets, skids, containers, and both ship and receive warehouse items. FloorScalesDirect.com offers 4x5 industrial floor scales along with industrial-strength weighing decks, digital indicators, and all required cables and cords for operation. With a 5000 lb floor scale package, you can utilize the power and accuracy of an industrial weighing scale to make your business more efficient. The industrial floor scales we offer are constructed using heavy duty steel and are ready to handle the weight of your shipments. Our floor scale packages ship free to many places within the U.S. and you can also look for our “Quick Ship” option, which allows us to ship your order by the next business day! Choose a 5000 lb floor scale package from FloorScalesDirect.com and let us handle your industrial weighing scale needs.